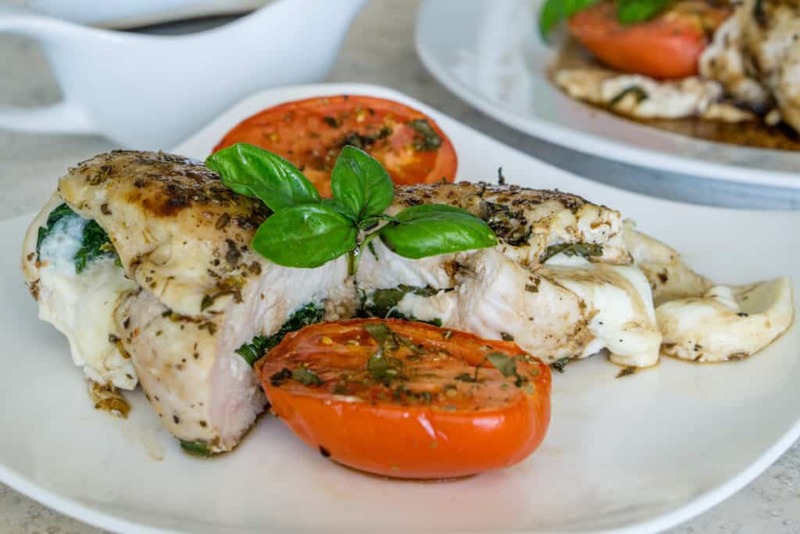 Make this classic Spinach and Mozzarella Stuffed Chicken Breast with Roasted Tomatoes for dinner tonight! This easy, healthy, gluten-free recipe is a family favorite. 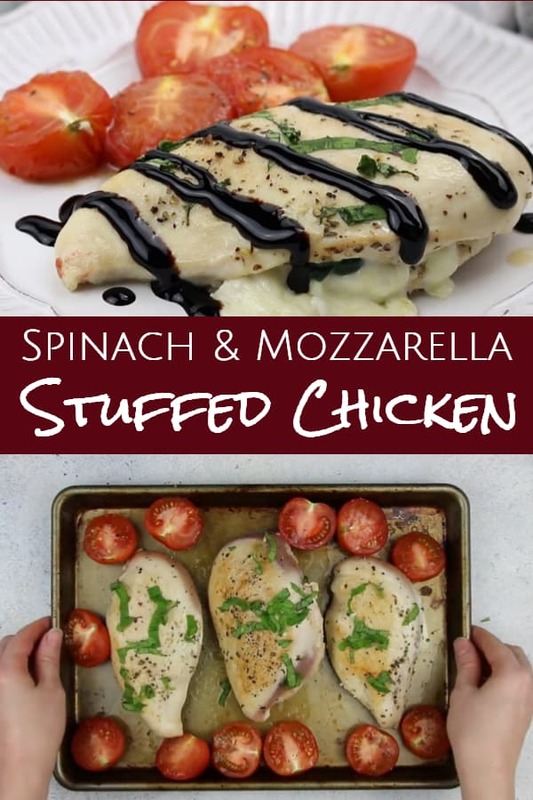 There is a reason this Spinach and Mozzarella Stuffed Chicken Breast recipe is an absolute classic. It is just the perfect combination of flavors and such an easy-to-prepare dish. Everyone loves it. It’s healthy. It uses simple, wholesome ingredients. It doesn’t get better than this. Oh wait, it does. 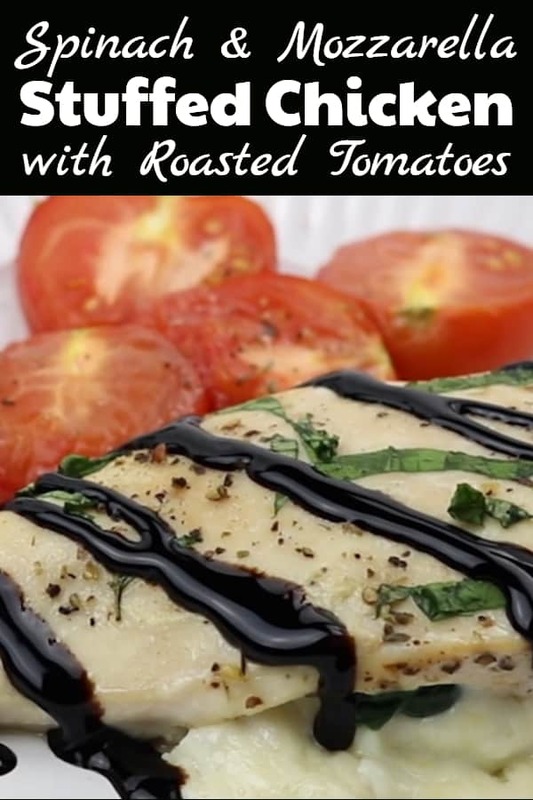 🙂 I add some roasted tomatoes which get so sweet and juicy while roasting, and I top everything with an irresistible Balsamic Glaze. Serve this dish over pasta, rice, or with some crusty bread to mop up all the flavorful juices from the roasting pan. It is so so good. 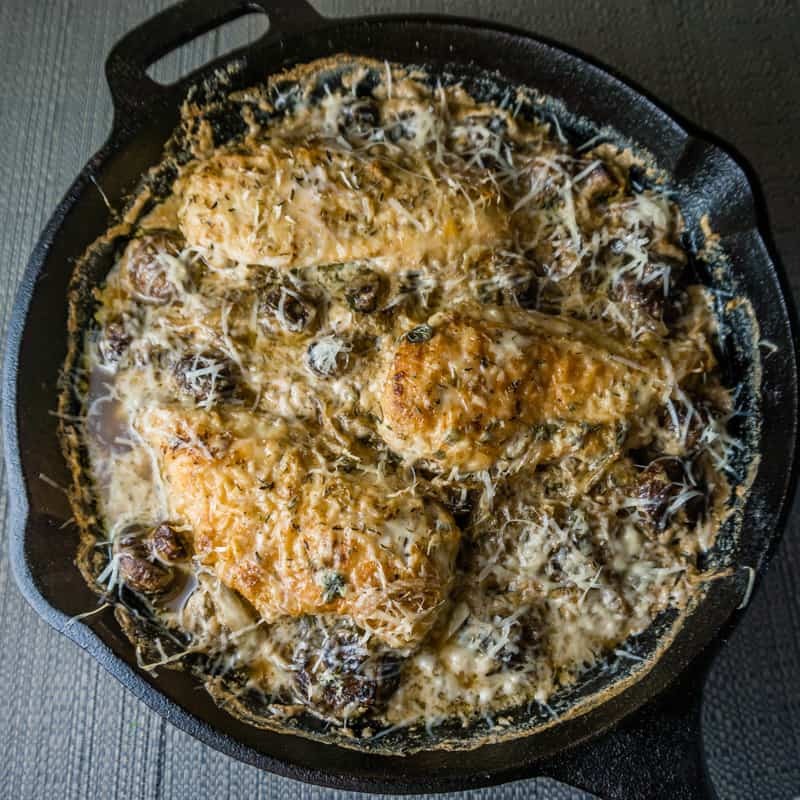 For this recipe, I season the chicken breasts with salt, pepper, and Italian seasoning. Then I stuff the chicken with baby spinach, fresh basil, and fresh mozzarella. When they are all stuffed, into the skillet they go to get that nice golden brown color. After I brown the chicken, I transfer the stuffed chicken breasts to a baking sheet along with halved Roma tomatoes (also known as plum tomatoes), and everything roasts until both the chicken and tomatoes are done cooking. The finished dish comes out absolutely beautiful every time. The golden brown chicken, the rich red color of the tomatoes, the bright green of the fresh basil and spinach…. Gorgeous! Most of the time when I serve dinner at home, I just serve the food onto my husband and my plates – I find it much easier this way instead of getting out all the large platters and dirtying extra bowls. But this chicken and tomatoes dish comes out so gorgeous that I can’t help but serve it on a nice platter so that we can enjoy the food with our eyes before we dig in. I drizzle a bit of Balsamic Glaze over the roasted chicken and the tomatoes, and that adds even more flavor to this dish. The sweet and tangy balsamic glaze goes great with the browned chicken, the fresh mozzarella, and the roasted tomatoes. This recipe uses 4 full cups of fresh baby spinach which cook down and ‘hide’ in the chicken breast. I also add fresh basil into the stuffing so that the chicken has a ton of flavor from the inside out. So each serving of this dish contains a full cup of spinach, some fresh basil, and a whole tomato. 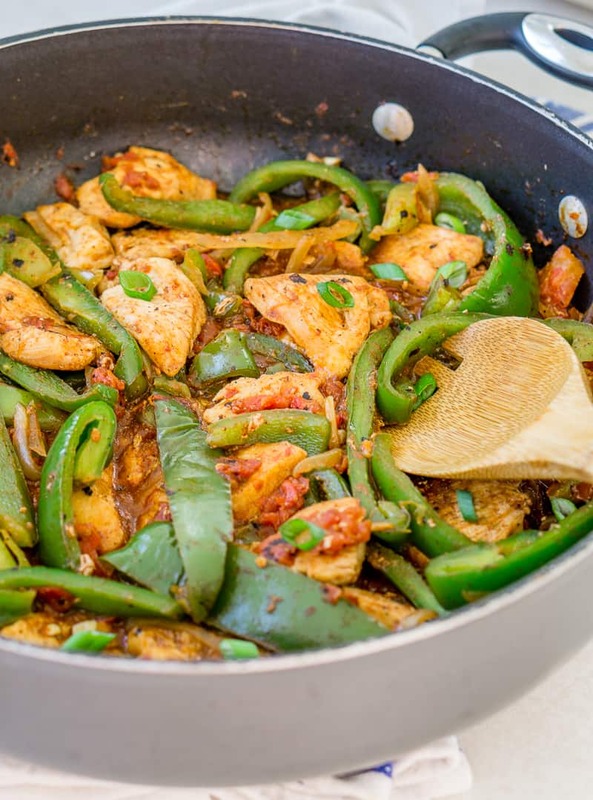 Combined with the fact that chicken breast is lean and high in protein, this makes a very healthy dish! Sure, there’s a bit of mozzarella cheese in there, but overall it is still a very healthy recipe. 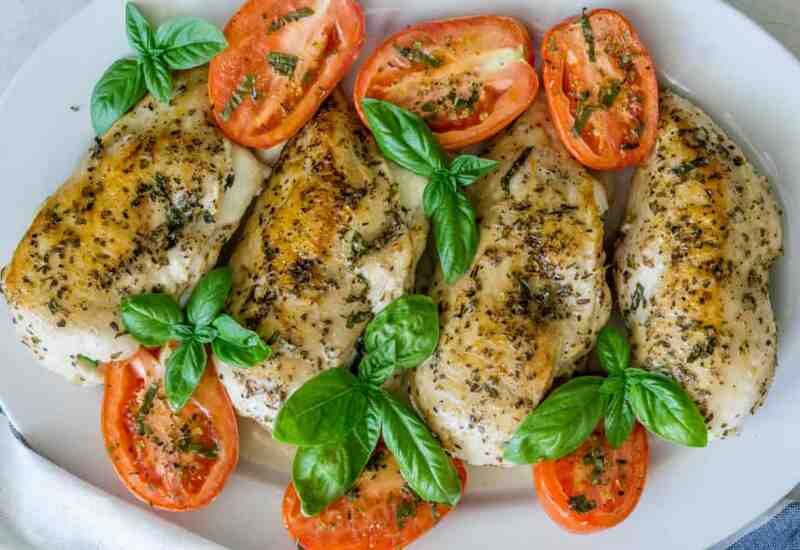 Start by roasting the tomatoes while preparing the chicken, since the tomatoes take the longest to cook. Pan-fry the stuffed chicken breasts to get that beautiful golden brown color. 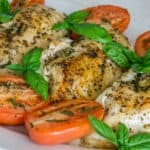 Add the chicken breasts to the baking sheet with the tomatoes and bake until the chicken is fully cooked. 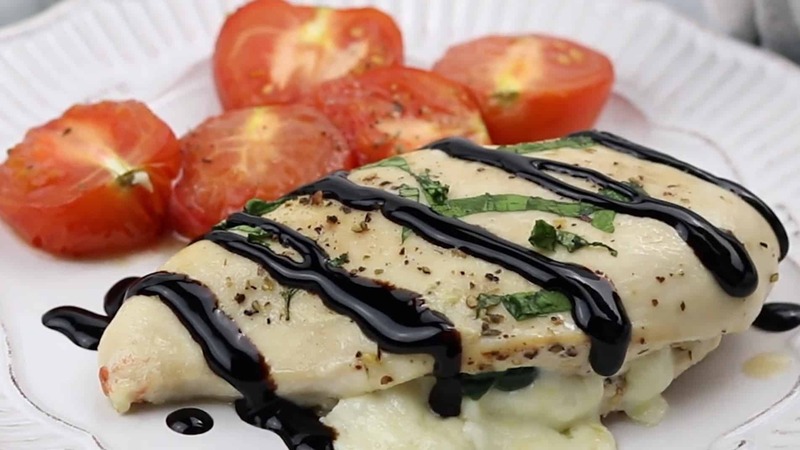 Plate the chicken breast and drizzle with balsamic glaze. 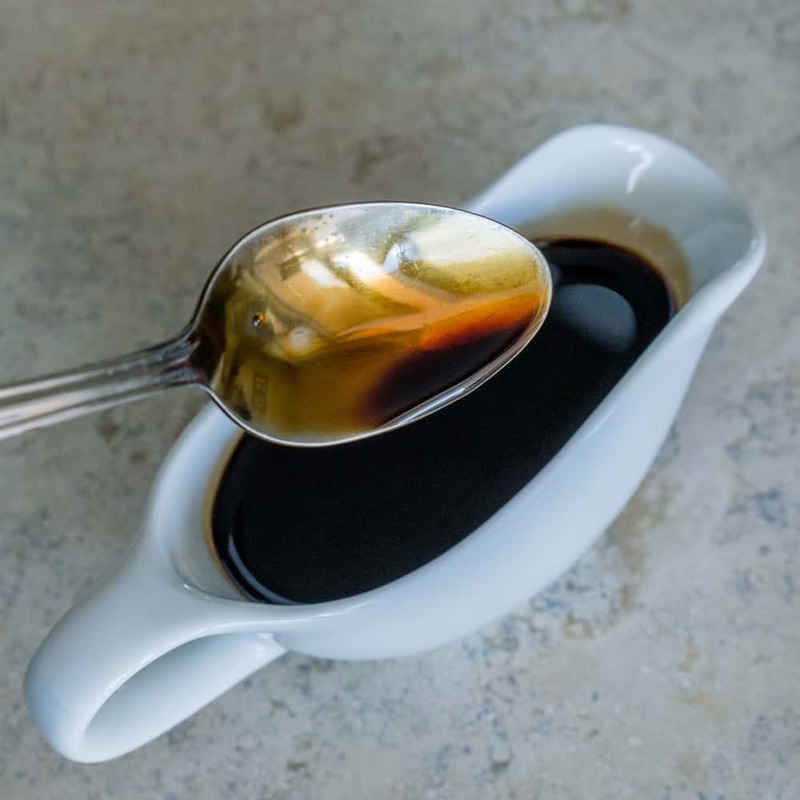 balsamic glaze – do not skip this, trust me! 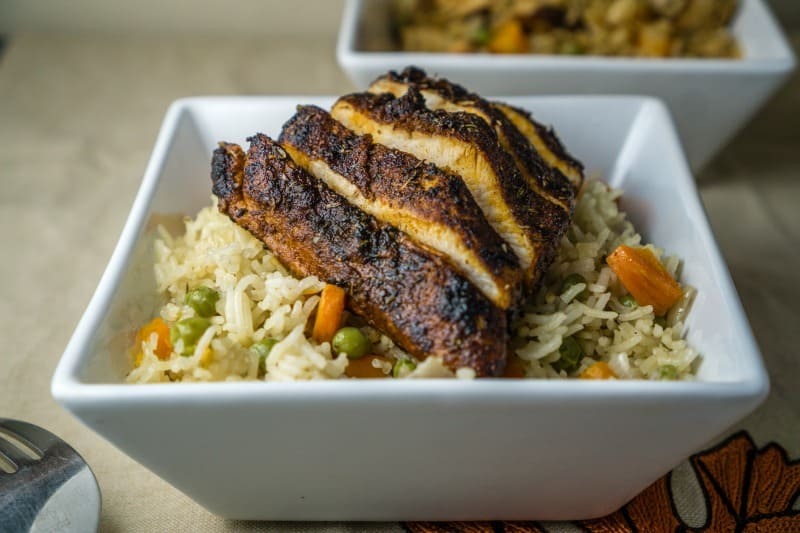 Oh, and here’s a little kitchen tip for cooking perfectly tender chicken breast every time without drying it out: As you preheat your oven, add an oven-safe container with water on the bottom rack of your oven. The moisture from the water evaporating will keep your chicken nice and moist (sorry if you hate that word!) and it won’t dry out. I use this trick every time and it hasn’t failed me once. 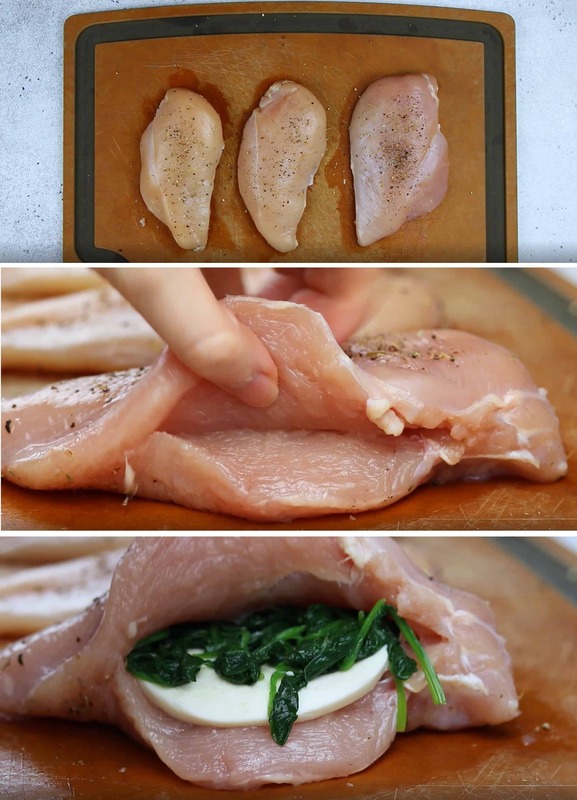 Make this classic Spinach and Mozzarella Stuffed Chicken Breast for dinner tonight! This easy, healthy, gluten-free recipe is a family favorite. Preheat oven to 375F. Brush or spray a large baking sheet with olive oil. Fill another oven-safe container halfway with water and place on the bottom rack of the oven. The steam from the water will keep the chicken juicy and tender. Slice the tomatoes in half. Season each half of the tomatoes with salt, pepper, and a pinch of Italian seasoning. Drizzle the tomatoes with a bit of olive oil (about a tablespoon between all tomatoes). 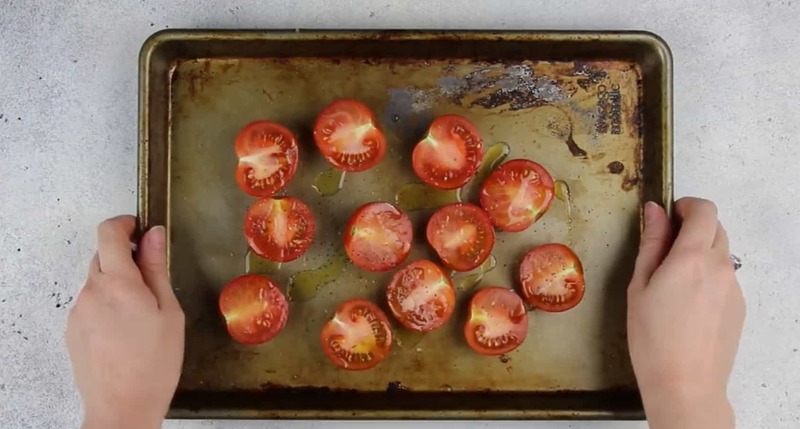 Place the tomatoes on the baking sheet and onto the top rack of the oven. The tomatoes will need to roast for a total of ~20-30 minutes. Microwave the baby spinach in 30 second intervals until it is wilted (about 1-2 minutes total). Use paper towels or a clean kitchen towel to soak up the extra liquid from the spinach. Be careful, it will be hot! Make a pocket in each chicken breast, taking care not to slice all the way through. Generously season the outsides of each chicken breast with salt, pepper, and Italian seasoning. Stuff each chicken breast with 1/4 of the spinach, 2 oz of mozzarella, and about 3-4 basil leaves. If needed, use a toothpick to "sew" up the chicken breasts so the stuffing doesn't fall out. Heat 2 tablespoons of olive oil in a large skillet. Carefully place the chicken breasts in the skillet smooth side down. Cook over high heat for 5 minutes. 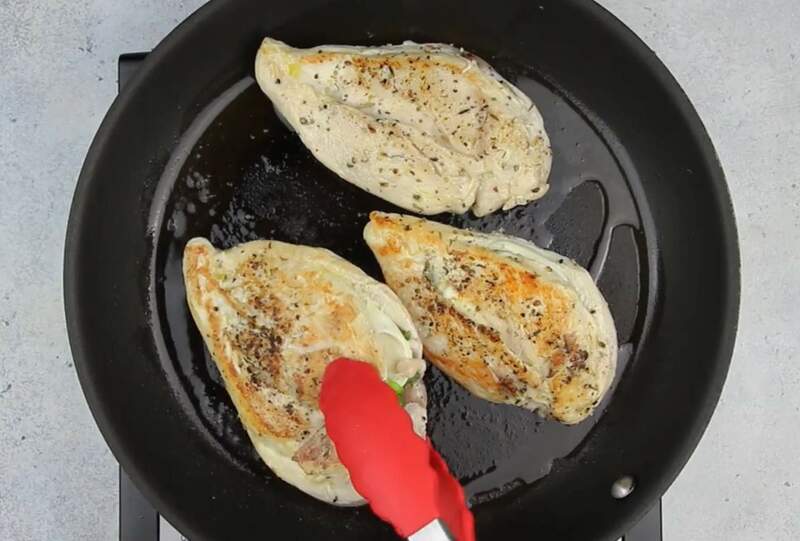 Use tongs to carefully flip each chicken breast, taking care not to lose the filling. Cook for 3 minutes on the other side. 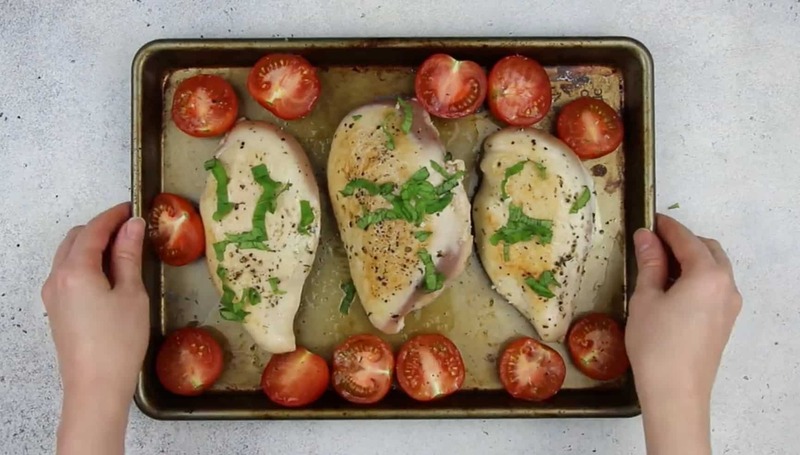 Carefully get the baking tray from the oven and place the chicken breasts into the tray next to the halved tomatoes. Tear 5-10 basil leaves and sprinkle them over the chicken breasts and tomatoes. Place the baking tray back into the oven and roast for 10-15 minutes, or until the chicken is cooked all the way through and the tomatoes are roasted to your liking. Remove from oven, allow to cool for 5 minutes, and drizzle with Balsamic glaze to serve. May I interest you in some more chicken dinner recipes?